Looks like we're in for a three-act introduction to Microsoft's new Xbox. We'll kick things off with a May 21 reveal event, follow it up with an E3 2013 press gathering on June 10, then round out the summer with an Xbox return to Gamescom 2013. 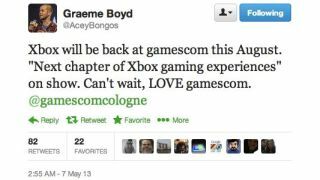 "Xbox will be back at gamescom this August," tweeted Graeme Boyd, social media marketing manager at Xbox EMEA, today. "'Next chapter of Xbox gaming experience' on show. Can't wait, LOVE gamescom." There's less to go on for what's in store at the Cologne, Germany conference than the other two events (not that details for those are crystal clear), but if the console is to come out around the holidays, maybe August is as good a time as any to give us a looksee at the console? That, or more game titles. We're two weeks away from Xbox's May 21 event, but we've got news blips ready for your reading pleasure right now.